RAHIMYAR KHAN (92 News) – PPP chairman Bilawal Bhutto Zardari has said that his relation is not with the people today, but it has been for generations. Addressing a public meeting in Jamal Din Wali on Saturday, he said that his fight against usurpers and opportunists. He said that the government was spending the money on the Orange Train project. “Farmers are being crushed here, but the government is protecting the interests of Indian farmers,” he said. 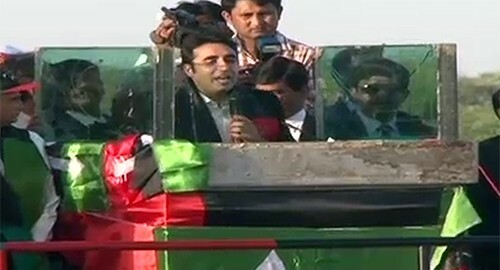 Bilawal Bhutto said that the government was selling institutions at throwaway prices. Syed Yusuf Raza Gilani, Syed Khurshid Shah and Makhdoom Ahmed Mahmood were also present on the occasion. Mismanagement and quarrels of workers were witnessed during the meeting.